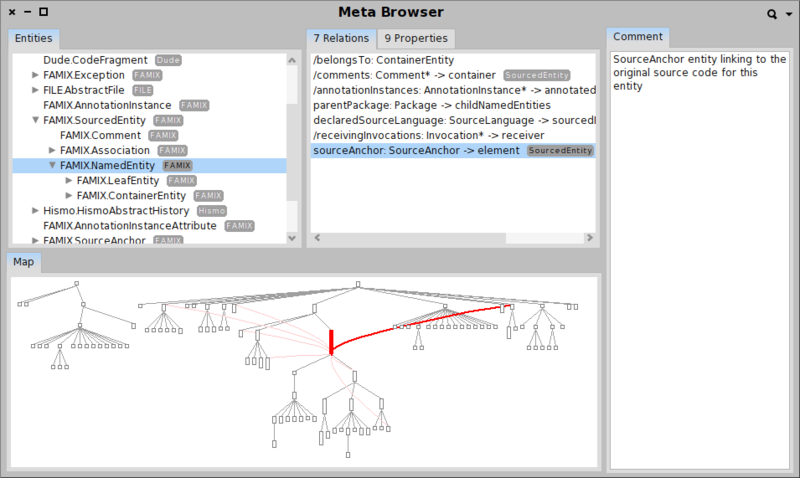 Moose makes heavy use of meta-descriptions to manipulate models, to provide import-export functionality and to build on the user interfaces on the fly. These meta-descriptions are built out of source code annotations. While the default code browser can be used to edit the code, it does not provide appropriate support for viewing and managing the relationships between these meta-descriptions. To improve the situation we used the capabilities of Moose to build a dedicated browser. Given that the data was already readily available, the effort to build the first working version took only a couple of hours. The overall effort for producing the final version that includes search capabilities took slightly more than a day of work. A screenshot of the resulting browser can be seen below.